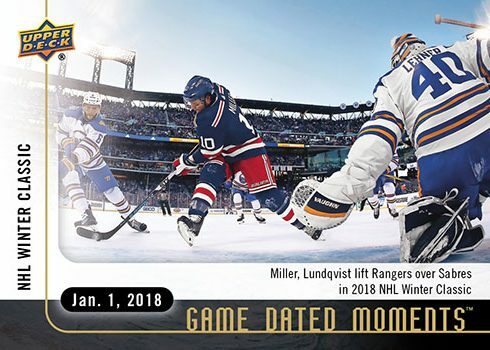 New 2017-18 Game Dated Moments Packs for Week 13 are Now Available on e-Pack! Kane scores his 300th goal late in the second period, becoming only the 21st US born player to do so. 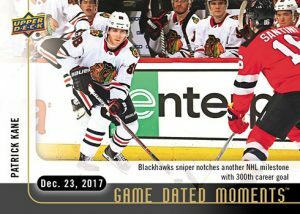 Kane also joins a very prestigious short list of Blackhawks legends to reach the 300 goal milestone, which includes Hall of Famers Stan Mikita and Bobby Hull. The never aging Jaromir Jagr moves solely into 3rd place for most NHL® games skated in his 1,732nd affair on the ice, further solidifying his Hall of Fame caliber resume. 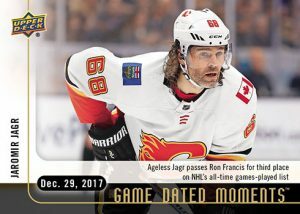 Off the rebound, the Ranger’s young left winger, J.T. 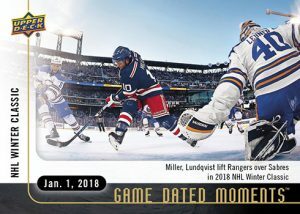 Miller, slaps the puck past the Sabre’s goalie and scores the overtime winner in the outdoor New York showdown at Citi Field during the 10th Anniversary of the NHL® Winter Classic. 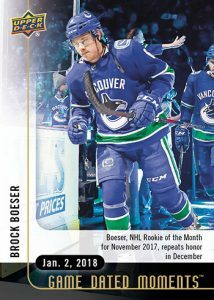 After receiving the same honor for the month of November, the young Vancouver phenom takes home his 2nd straight NHL® Rookie of the Month Honors for December as he further establishes his bid for 2017-18 NHL® Rookie of the Year.